A lot of nasty things go on behind closed doors. Free from scrutiny, groups, governments, and companies often get up to no good, safe in the belief that their images will remain squeaky clean, no matter how filthy their actions may be. If not for the brave actions and dogged determination of a few men and women who make it their trade to uncover malfeasance and force institutions into the light, some of the greatest crimes and abuses in history might never have been revealed. These men and women came to be known as “muckrakers.” Although the term started out as a pejorative, it has since become a heroic moniker for anyone who digs and digs to find the truth. Here are ten of the best muckrakers in the history of the American press. It may seem laughable to us now (except for those of us who buy Noni juice), but there was a time in American history when anybody could mix a few ingredients in a bottle, stick a fancy label on it, and sell it as medicine. Called patent medicines, these concoctions were sold across the nation by traveling men who promised to cure all that ailed you. In a time where real medicine was undiscovered or hard to come by, the promise of relief from the aches and pains of a difficult life was all most people needed to part with their hard earned money. Some of the stuff actually worked, but since there was no testing, no standards, and no oversight, people had no idea if what they were getting was real, harmless, or dangerous. Even the stuff that did what it promised often had nasty or fatal side effects. In 1905, appalled by this wholesale rip off of the American people, journalist Samuel Hopkins Adams published an article in Collier’s Magazine called “The Great American Fraud.” In it, he exposed the dangers of the medicines, which often had large amounts of alcohol or narcotics in them. Because of his work, the government began requiring makers of the medicines to clearly label their ingredients and eventually banned them. In 1911, The Supreme Court overturned laws preventing companies from making fraudulent claims, and Adams, who had since become a popular fiction writer, returned to his muckraking roots and attacked them all over again. This time for good. Love him or hate him, there’s no arguing that Julian Assange has brought muckracking into the 21st Century. A former hacker and software programmer, Assange started the website Wikileaks in 2006 to further his agenda of “radical transparency.” A place where whistleblowers can anonymously share classified documents, under Assange’s editorship, Wikileaks has exposed corporate malfeasance, Church of Scientology secrets, and most famously, a massive trove of U.S. diplomatic cables and documents that detail the dark realities behind the wars in Afghanistan and Iraq. About as far from a traditional journalist as a website is from a newspaper, Assange doesn’t investigate crimes and abuses, but he does provide an instant, worldwide forum for those who do. He’s a difficult man to praise, what with his persecution complexes, arrogance, and outstanding sexual charges, but his legacy in the long line of those who would drag the truth into the light is solid. Wikileaks remains an important place for those who have nowhere else to tell their stories. As long as it remains so, Julian Assange deserves the respect and admiration of all those who believe that secrets must be exposed. The name Lincoln Steffens may not jump to the minds of most people when they think of great American journalists, but it should. People like Steffens were the original inspiration for the term “muckraker.” Writing for the New York Evening Post and McClure’s in the very early part of the 20th Century, Steffens attacked and exposed one of the greatest centers of corruption known to man: municipal governments. In a series of articles that later were collected in the book The Shame of the Cities, Steffens outlined the cruel and inequitable machinery that operated in all areas of municipal life. A revolutionary at heart, Steffens hoped that by showing how badly the poor and recent immigrants were abused and disserved by the people who ran their cities, people would be moved to the streets to demand a change. It didn’t happen of course, but Steffens still managed to take uncaring officials to task, and helped create the healthy cynicism of the modern American voter. Steffen’s reputation suffered after he became a communist and wrote articles full of glowing praise for the Soviet Union. He later became disillusioned with the ideology (as did most Western leftists) and he abandoned it shortly before his death. Today, far removed from the ideological battles of the time, his legacy is that of a man who saw abuse, could not tolerate it, and told the world. These days, Ralph Nader is largely remembered (at least by Democrats) as the man who gave the world George W. Bush. As a third party candidate in 2000, many argue that he bled off just enough progressive votes to prevent Al Gore from an outright win, instead of the contested one that was eventually overturned. Before his forays into presidential politics, Nader made his name as a vigorous, passionate consumer advocate who made it his crusade to expose the glaring safety violations of major American companies. His first target was the automobile industry. In 1965, he published a bestseller called Unsafe at Any Speed, which highlighted the dangers of some of the most popular cars in America. Nader’s vigilance didn’t earn him any friends in Detroit, and several companies hired investigators to tap his phones, and even hired prostitutes to lure him into a scandal. Undeterred, he continued his campaign and was a key figure in the new wave of automobile safety regulations in the 60s. He used his newfound fame (and the hundreds of idealistic young people it inspired) to publish books on environmental concerns and government corruption. His presidential campaigns have since tarnished the excellent work he did in making the country a safer and more honest place. Hopefully in the long run, history will remember Nader for the latter. Some muckrakers are remembered for one book, article, or news story that revealed one abuse. Others, like Seymour Hersh, make a career of digging and rooting through the trash of our institutions, exposing lie after lie, secret after secret. From the beginning of his career, he learned that the real stories weren’t to be had listening to official press briefings and company lines. Hersh believed that if you wanted to hear the truth, you needed to go one on one with the people who lived and breathed a story. This philosophy served him well, and led him to some of the most famous stories of the 20th Century. The first major story Hersh broke was the infamous My Lai Massacre in Vietnam. The 1969 massacre, which involved U.S. soldiers killing hundreds of unarmed Vietnamese civilians, galvanized the anti-war movement and helped sink public support for the war. If My Lai was the only story of Hersh’s career, he’d still belong on this list, but he was just getting started. Over the next 40 years he broke stories on C.I.A. plots, Israel’s nuclear program, and all sorts of government mischief in the Middle East and elsewhere. Hersh even had the story of the Abu Ghraib Prison Abuse Scandal until he was scooped at the last minute by 60 Minutes. Nevertheless, his articles on the scandal in The New Yorker provided the context and detail behind the shocking images. Seymour Hersh remains one of the premier muckrakers in the country. Always searching and never satisfied with official answers. It’s an old joke that nobody wants to know what exactly goes into a sausage, but it wasn’t until Upton Sinclair published his landmark book The Jungle in 1906 that people realized just how much they didn’t want to know. Mostly concerned about labor abuses, Sinclair went undercover for seven weeks, gathering data on the horrific practices of the Chicago meat packing industry. His investigations led to the publication of the book. Although Sinclair (a lifelong socialist) was attempting to bring to light the exploitation of workers at the stockyards, the public instead focused on the disturbing revelations of the flagrant lack of concern over cleanliness and the disgusting conditions of the meat packing facilities. If they’re lucky, a muckraker will find a great story that highlights abuse or corruption, they’ll publish it to widespread acclaim, and they’ll go down in history as a hero who stood up to those who keep us in chains. Gary Webb was not a lucky man. 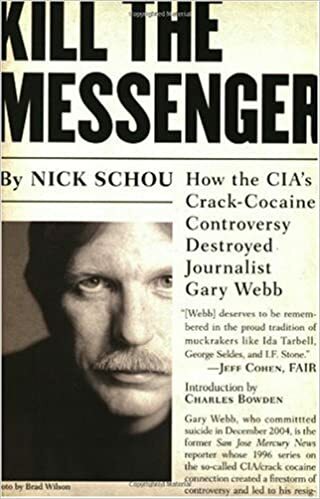 In 1996, Gary Webb published a series of articles in which he alleged that the C.I.A., with express help from the Reagan Administration, was actively involved in bringing large amounts of cocaine from Nicaragua to the streets of Los Angeles. Yes, while Nancy Reagan was telling Gary Coleman to “just say no,” the United States was helping a drug cartel create a brand new drug epidemic in a major American city. Webb outlined in painstaking detail the convoluted plot to finance Nicaraguan rebels (who happened to be cocaine dealers) by creating crack cocaine, a cheaper, highly addictive version of the drug that even poor inner city kids could afford. Needless to say, the government freaked. And unfortunately for Webb, almost every single major newspaper took the government’s side and attacked his journalism. Webb won a Pulitzer Prize for the series and everything he alleged was proven true, but the relentless attack on his credentials and the furor his reporting had caused basically ended his career. He moved from job to job, but was never able to get work at a major newspaper again. He was found dead from an apparent suicide in 2005, punished for revealing the truth. 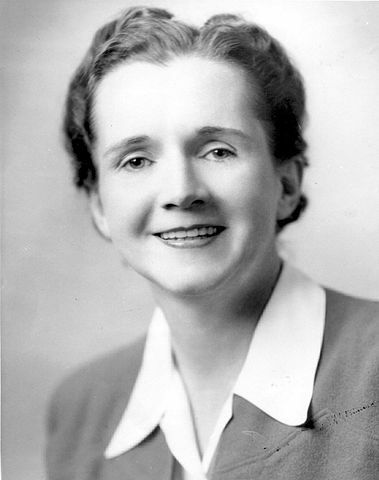 Rachel Carson was a scientist and naturalist who came to fame writing engaging and lyrical descriptions of the natural world in popular articles and best-selling books. A lot of people write about nature, but Carson evangelized it. She was a true believer in the beauty and complexity of the natural world and her gifted prose made her one of the most beloved nature writers in American history. In 1957, Carson – who had also worked for the Bureau of Fisheries – started to become concerned with the widespread use of synthetic pesticides like DDT. At the time, there was no organized environmental movement and most people viewed nature as a dumping ground with infinite capacity. Carson devoted all of her energies to alerting the world of the dangers of chemical pesticides and in 1962 released Silent Spring, a shocking report filled with example after example of exactly how pesticides were harming the environment. The book was an immediate bestseller, and almost single-handedly created the modern environmental movement. Across the country and the world, thousands were moved by Carson’s work to organize and the movement she spawned led not only to the banning of DDT, but also to the creation of the Environmental Protection Agency. Carson died from cancer only two years after the book was published, but her love of the natural world and her tireless efforts to protect it still resonate today. That’s what one person with a typewriter and a conviction can do. 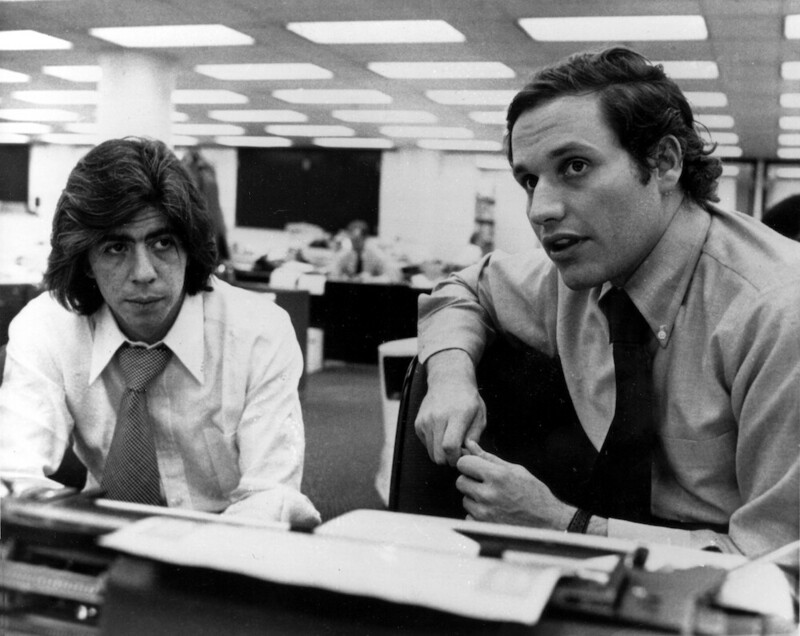 Carl Bernstein, left, and Robert Woodward, who pressed the Watergate investigation, in Washington, D.C., May 7, 1973. Although “muckraking” was a term that came about at the beginning of the 20th Century, two of the most famous muckrakers made their reputation in the 70s. Bob Woodward and Carl Bernstein were two young reporters for The Washington Post who stumbled upon the biggest news story (and greatest scandal) in American history. Assigned to report on the burglary of the Democratic National Headquarters at the Watergate office building, Woodward and Bernstein dug deep and eventually uncovered a tangled web of dirty tricks, outright crimes, and persistent lies that went all the way up to the White House. They called themselves “investigative journalists” and the term has largely stuck. But their dedication, persistence, and willingness to go against prevailing wisdom when they knew they were right makes them muckrakers of the highest order. They proved that if a journalist did his job and stuck to his guns, no one was immune from his power. Not even the President of the United States. 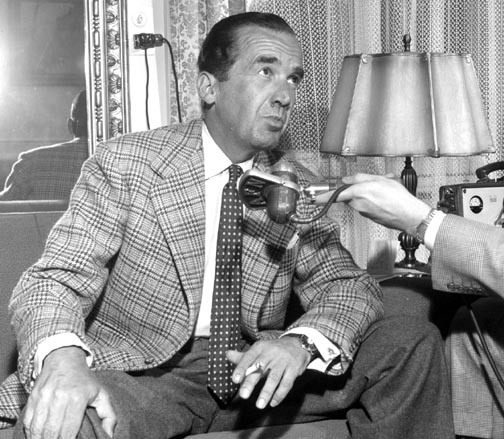 Few American journalists ever reach the professional heights that Edward R. Murrow did. With the exception of Walter Cronkite, he remains today, almost 50 years after his death, one of the most respected figures in the industry. Murrow rose to international fame during the Second World War as the London Correspondent for CBS radio. His live rooftop reports brought the Blitz home in vivid detail to the American people and helped push popular sentiment towards joining the war. Once the war was over, he returned to the States and continued his brand of top quality journalism on radio and eventually television. It was on television- as part of his famous news program See It Now – that Murrow conducted his most searing investigation. Troubled by what he saw as an encroachment of civil rights by the actions of Senator Joseph McCarthy and his campaigns to root out communist infiltration of American society Murrow decided to get to the truth. Using the new medium to its fullest power, Murrow used McCarthy’s own speeches against him, damning the man in his own words. A style that still works today and has come to dominate cable news. Murrow was ambivalent about TV and famously lectured executives over their use of it, but few people have ever been so effective in combating injustices with TV as Murrow. He was a master journalist, a consummate professional, and did no less than make the country a better place. All by not being afraid to shine a light in the darkest corners of our world. 1. Gary Webb’s conclusions weren’t “proven”. What was proven was that the CIA partnered with groups that ran drugs (partnering with groups in Nicaragua that didn’t run drugs was nearly impossible). What was not proven was that the CIA started the crack epidemic. Webb’s “sources” included drug dealers who made those claims, but those claims were never proven. That’s why so many major media outlets rejected his conclusions. 2. Ah… Rachel Carson. Claimed that DDT was going to kill off all the birds in their eggs on the planet and thus got DDT banned. Of course, it also killed mosquitoes that caused malaria and other mosquito-borne diseases, and by not killing those mosquitoes, tens of millions of people have died. Birds were still mysteriously being born during the spraying of DDT, but who cares? At least we got rid of that chemical! Sure, millions of people are dead, but at least there’s less DDT, right? DDT is also a carcinogen that greatly increases the risk or breast cancer in women who are exposed to it before puberty. Let’s not go touting Rachel Carson as some evil agenda driven harpy without looking at all the facts. Except that Carlson was not a scientist and used propaganda and psuedo-science to push her agenda. It has been proven, through the governments and epa’s own studies, that DDT was and is not as harmful as first thought. So millions of people have died of malaria because of the first psuedo-scientist. Carlson was the start of the hysteria of the green movement. And now it has ended with the ridiculous Al Gore and the exposure of the lies told by environmentalists in order to further their political agenda and keep the millions of tax dollars flowing in. That was J. Gordon Edwards, who appeared in Esquire Magazine, consuming a teaspoon of DDT in 1971. That super-toxic carcinogen had massive effects on his health and he died in a quivering mass 2 seconds later, growing trees out of his ears. Yeah, I’m kidding. He took a teaspoon of DDT every week for the rest of his life just to prove Rachel Carson wrong and finally died in 2004 at the age of 84 from a heart attack while climbing a mountain. Just because a chemical is a carcinogen doesn’t guarantee that a person will get cancer, millions of people smoke and not all of them die of cancer. I’m not saying she wasn’t agenda driven but the issue is not black and white. On the one hand I don’t think it’s fair to say she caused millions of people to die from maleria and I also think it would be unfair to try to claim that she saved millions of women from breast cancer. Well, that’s, like, your opinion, man! The problem is that DDT was controlling mosquitoes (the source of malaria and many, many other diseases). Her efforts to end the use of DDT (based on a ridiculous, unproven theory that all the birds would die) meant that mosquitoes weren’t going to be controlled. The result: around 3,000,000 people die every year from mosquito-borne diseases. She didn’t save anyone from breast cancer, either. Heavy DDT exposure does increase the risk, but a link to moderate exposure isn’t proven. I would put Michael Moore on that list, like him or hate him he did bring some issues to the table. Woodward and Bernstein, what a great story. Some of these stories have not ended so well for the Muckrakers though. I would have thought that Julian Assange was one of the biggest of all time?